While not strictly about XLRI, this article by Schumpeter in The Economist , is a wonderful essay on the town of Jamshedpur/Tatanagar. COMPANY towns used to be common in the West. The Cadburys and Rowntrees built them in England, as did William Hesketh Lever, founder of what is now Unilever. At one point the United States had more than 3,000 of them. They were particularly popular in the South and West, and in the mining and lumber industries. But they have long since disappeared, destroyed by the motorcar, the cult of corporate focus, and the general maturing of the economy. As so often, what is dying in the West is surviving or being reborn in the emerging world. New company towns are being constructed from nothing, most notably in China. And old ones are being given a new lease of life. But even with all this new activity Jamshedpur, the corporate headquarters of Tata Steel and home of its biggest steel plant, continues to lead the pack. 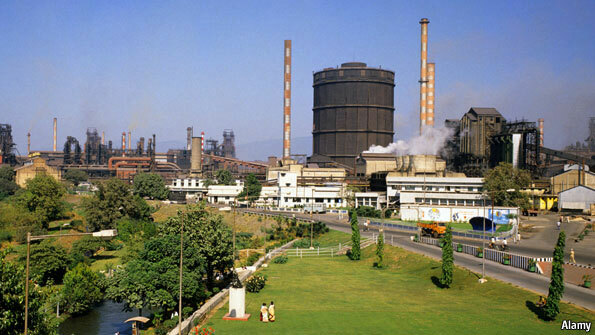 Jamshedpur was created at the turn of the past century to solve a practical problem: the resources needed to make steel, in the form of coal, iron ore and running water, were stuck in the middle of an isolated forest. 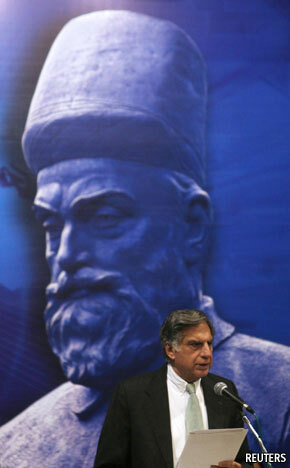 But practicality was also infused with idealism: Jamsetji Tata, the founder of both the town and of what became the Tata Group (pictured here with his great-grandson Ratan Tata, the group's modern-day boss), wanted to create an industrial jewel, with wide avenues, good schools and generous sports facilities, to prove that India was capable of economic independence. Of late the town has become more ambitious still. Tata Steel has become a global force, gobbling up, among others, Britain's Corus. But the company has modernised and expanded, rather than qualified and limited, its relationship with the town and its surrounding region. Again, practical and idealistic considerations are reinforcing each other. The state administration is incompetent. The Naxalite rebellion is a growing threat (I travelled 30 miles into the countryside and saw plenty of signs of soldiers camped out to deal with insurgents). The Western doctrine of "corporate social responsibility" (CSR) has also given the founder's very Victorian vision a new lease of life. "We also make steel"The result is odd, to Western eyes. Tata Steel runs a 900-bed hospital, and provides its workers with accommodation ("I have a company house and a company car," says one manager, "all I had to bring was a wife.") Jusco, a Tata Steel subsidiary, provides the town with its utilities, and keeps it clean and well-ordered. The company employs 250 people who are responsible for rural outreach. They teach tribespeople how to grow crops, give advice on HIV, help create irrigation systems, and generally act as mentors to the rural population. They also provide all sorts of social services to poor city dwellers. Tata Steel pays for a huge sports centre, which is open to all, in the shadow of the steel mill. It also runs several sports academies, for archery, athletics, cricket and, above all, football, which train people from all over the country. The football academy has trained 142 people who have played for their country in various capacities, and has frequently formed a tie-up with Sheffield United, which is a much admired team in these parts (from England's most famous steel town). Tata also owns the local newspaper and even runs the town's zoo. Far from apologising for all these activities, Tata is so proud of them that it uses the phrase "we also make steel" in its advertisements. There are clearly good commercial arguments for some of these activities. The company has to step in to fill institutional voids left by the market (which is underdeveloped in such an isolated spot) and the government (which is ineffective). Creating national sports stars from scratch is arguably even better for your brand than sticking it on the shirts of established stars. Tata Steel has not had a strike since the 1920s, and has so far escaped the wrath of the Naxalites. But there is surely a question of where good strategy stops and where sprawl begins. Does Tata Steel know when to say no? Or will it be constantly pulled into new CSR activities that will divert too many resources from its core mission?